(Nanowerk News) Companies, authorities and scientists can save time, money and test animals in the risk assessment of nanomaterials by using available data. 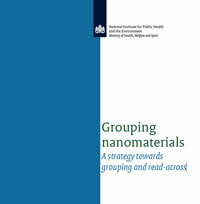 The Dutch National Institute for Public Health and the Environment (RIVM) has commissioned the development of a strategy to evaluate the potential for read-across in case of missing data for nanomaterials with a focus on fulfilling data requirements in regulatory frameworks. Testing for the full set of effects that chemicals can have on humans and on other species like fish requires a lot of time, money and test animals. To minimise costs and animal use, the existing data for similar substances can be used to fill in data gaps for a chemical substance via a process called read-across. Companies, authorities and scientific institutions can apply the read-across strategy in the assessment of effects of nanomaterial in humans or the environment, for example to fulfil their legal obligations. To develop this strategy, a literature review was compiled on physicochemical parameters (such as the rate at which and amount to which a chemical dissolves) and their relevance for the behaviour, fate and toxicity of nanomaterials in organisms and the environment. This review was based on current knowledge on the behaviour and toxicity of nanomaterials. It resulted in a base set of physico-chemical parameters that are essential to characterise a nanomaterial and substantiate possibilities for read-across. The strategy provides a framework in which to evaluate each nanomaterial and decide on the applicability of readacross for nanomaterials. The strategy was proven useful in two hypothetical case studies (nanosilver and nanotitanium dioxide). Nevertheless, it was concluded that improvement is needed for the documentation of the information from laboratory testing of nanomaterials to support read-across. Particularly relevant physicochemical properties of the nanomaterials and test conditions need more detailed descriptions. Further, the scientific community needs to continue to develop test methods that can characterise certain behaviours of nanomaterials to support read-across. Fast innovation Nanotechnology is developing rapidly. It offers us miniature laboratories on computer chips, UV-filters in sun screens and numerous other new potential products. Much is still unknown on the potential risks of nanotechnology for humans and the environment. Therefore, RIVM contributes to better risk assessment of nanomaterials by performing research and providing risk analyses and policy advice.